GTR #026: Arise, The Time Has Come! In this episode of Good Things Radio, Brooke shares registration success for the upcoming GTR’s women’s retreat, relates strong opinions about Halloween, throwing in the towel on homeschooling, and much more! This entry was posted in Podcast on October 23, 2015 by brooketaylor. 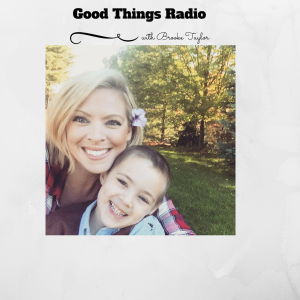 In this episode of Good Things Radio: The saga of the Georgia house ends, preparing for Halloween, GTR Retreat registration opens October 22nd, the effects of too much technology in the home and Jennifer hangs up her co-hosting hat for now. This entry was posted in Podcast and tagged costumes, Families, Halloween, Selling a house, technology, Women's Retreat on October 14, 2015 by brooketaylor. In this episode of Good Things Radio: Do Catholics worship the Pope? Thoughts on wearing pajama pants in public, an update on the GTR retreat and Brooke’s movie pick of the month. This entry was posted in Podcast and tagged Alive Inside, Family Movies, Mary, Modesty, Moms in Pajama Pants, Motherhood, parenting, Pope Francis, School, Virtue, Women's Retreat, World Meeting of Families on October 2, 2015 by brooketaylor.